Finally, Vodafone announces price of iPhone 3G Phone in India. There is an abyssal price gap between the US and India version. Your iPhone 3G comes with a complicated list of rules about what you can and can’t do with it. Free software foundation has published the list of 5 reasons to avoid Apple iPhone 3G. Now you can get offical version of Apple iPhone in India. Vodafone and Airtel started to accept pre-registration for iPhone3G. The RAZR2 V8 is a quad-band GSM and EDGE phone, it features two 240×320 TFT screens (one internal 2.2″ and one external touchscreen 2.0″), 512 MBs internal storage out of which 420 MBs are accessible, Bluetooth 2.0 with A2DP support, a microUSB charging/data/audio port, and a 2 MP camera without flash. The V8 came with a headset, a British-style charger (PureMobile added to the package both a converter and a mini-USB Motorola-branded charger), a microUSB 2.0 data cable, CDs and manuals, and a 770 mAh Li-Ion battery. 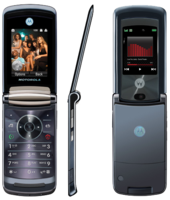 => Read review here and you can get Motorola RAZR2 V8 Spec Sheet here. It is believed that it is one of the most popular cell phones around the world. And now it has been updated to run Linux. There is also V9 model with 2Mp camera and a full HTML browser. I want one. I might get this one or may be Apple iPhone.